When deciding to purchase or adopt pets you have to consider where it is going to live and where it will sleep at night. Some people have no choice but to keep an animal outside but is this advisable? Pets can bring a lot of pleasure into our lives. For those living alone it is companionship and something to care for. For children they will learn about the responsibilities of feeding, grooming and general care of something that is reliant on them to be able to survive. There is also the possibility that owning pets will lead to a hobby or career in breeding, exhibiting or the many other careers relating to pets. Whatever type of pets you decide to own you will find that they need a dry snug place to sleep away from drafts, snow or rainfall. The sleeping area must have bedding depending on the type of animal you choose to own. The bedding should be changed often and either washed or disposed off in a responsible manner. There should also be drinking water available and the pets should be let out each morning for exercise. Children should be able to take on some of the chores for the pets including the messier jobs like cleaning out cages, hutches and kennels. They should be aware that there is more to keeping pets than simply play and cuddles. Dogs should not be kept outside is at all possible. They are companion animals and need to be near their owners. In reality they should have a bed in the kitchen, conservatory or hallway near to their owners with a blanket or bed of their own. If this is not possible an outside kennel should be purchased. Dog kennels should have an outside run and an inside part that can shut of at night. The whole dog kennel should have a waterproof kennel and a hard standing so that the ground does not become muddy or damp. The bed area must be raised from the ground as well. At the height of winter the dog kennels should have some form of heating that is safe, will not overheat and does not have cable and leads that can be chewed by puppies or older dogs. Rabbits can be kept outside but make sure they have a dry and water proof hutch to live in. 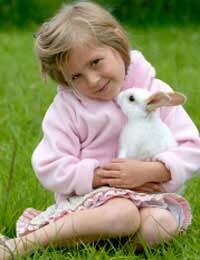 Rabbit hutches can be bought in various sizes depending on the size and breed of the rabbits. Try to have the rabbit hutches kept in a shed or outbuilding but if that is not possible then cover the rabbit hutches with tarpaulin to keep off the rain. Plenty of bedding will ensure that the rabbits are kept safe. The rabbit hutches should also be raise doff the ground so that they are not prey to foxes overnight. If it is your intention to adopt dogs, rabbits or any other pets and keep them outside you may find that many animal rescue centres will not entertain your request to adopt their pets. Homes are inspected before pets are signed over to new owners and one part of ownership is that you can give the pets a good home.